Obstructive uropathy occurs when urine cannot drain through the urinary tract. 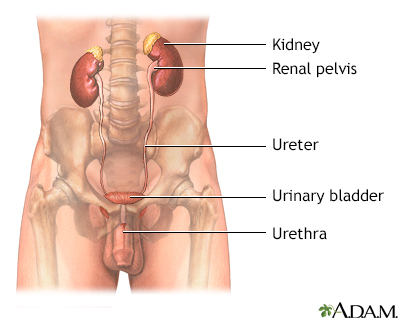 Urine backs up into the kidney and causes it to become swollen. This condition is known as hydronephrosis. 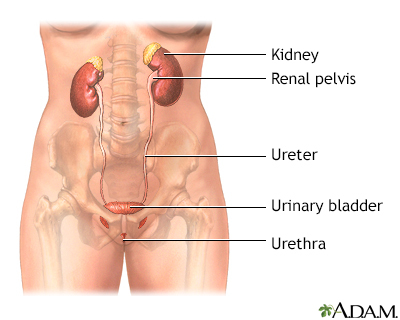 Obstructive uropathy can affect one or both kidneys. It can occur suddenly, or be a long-term problem. Mild to severe pain in the flank. The pain may be felt on one or both sides. Weight gain or swelling (edema) of kidney. Stents or drains placed in the ureter or in a part of the kidney called the renal pelvis may provide short-term relief of symptoms. Nephrostomy tubes, which drain urine from the kidneys through the back, may be used to bypass the blockage. A Foley catheter, placed through the urethra into the bladder, may also help urine flow. Short-term relief from the blockage is possible without surgery. However, the cause of the blockage must be removed and the urinary system repaired. Surgery may be needed for long-term relief from the problem. The kidney may need to be removed if the blockage causes severe loss of function. If the blockage comes on suddenly, kidney damage is less likely if the problem is detected and repaired right away. Often, the damage to the kidneys goes away. Long-term damage to the kidneys may occur if the blockage has been present for a long time. If only one kidney is damaged, chronic kidney problems are less likely. You may need dialysis or a kidney transplant if there is damage to both kidneys and they do not function, even after the blockage is repaired. Obstructive uropathy can cause permanent and severe damage to the kidneys, resulting in kidney failure. If the problem was caused by a blockage in the bladder, the bladder may have long-term damage. This may lead to problems emptying the bladder or leakage of urine. Obstructive uropathy is linked to higher chances of urinary tract infections. Call your provider if you have symptoms of obstructive uropathy. Obstructive uropathy can be prevented by treating disorders that can cause it.